I only wanted to browse. Seriously. But I went into the Saint Laurent store and this beauty caught my eye. It was last fall and this neutral pink bag was perched on the glass shelves. Meet the Saint Laurent Bellechase Shoulder Bag. It was a new color for Spring/Summer 2018 and it was the only one in the store. I tried it on and instantly fell in love with the easy-to-wear color and elegant shape. Everything in me said "Walk Away!" but somehow before I knew it, it was wrapped up, boxed, and ready to be taken home. This Bellechase bag's fold-over flap has a bronze push-fastening lock and measures 9.5" x 6.25" x 3". The exterior is reminiscent of Celine's classic box bag with similar rectangular shape and side-view. 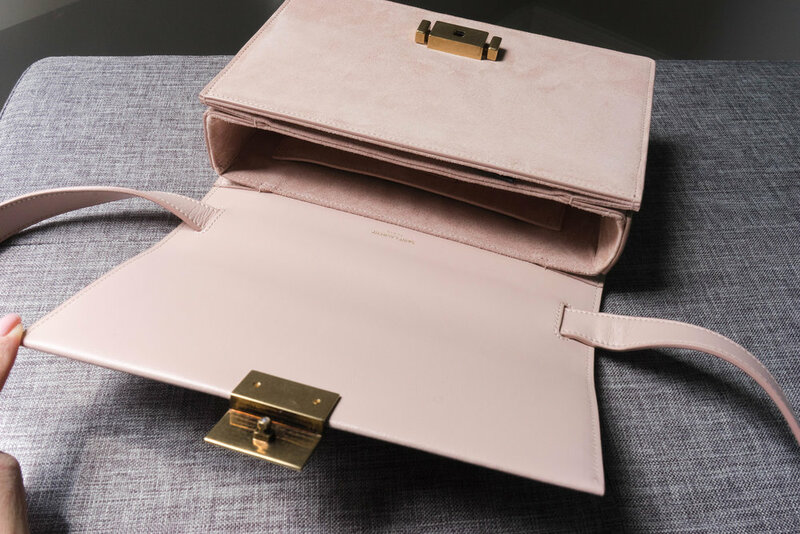 The color is appropriately called "rose", and comprised of calfskin leather and the softest suede. The leather looks and feels smooth throughout. The leather strap is removable and adjustable; it has an approximate drop of 21". The interior is also lined same suede as the exterior. There is 1 main compartment, 1 flat compartment, and 1 slot small pocket. Note that I may receive a commission on clicks and purchases from select links in this post. This shoulder bag is feminine and looks classic. The leather and suede are soft to the touch but still structured. 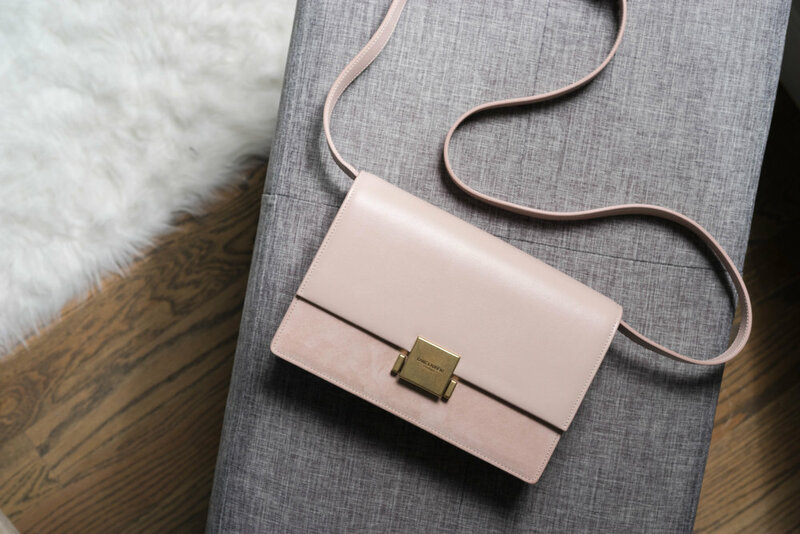 The generously long strap enables it to be worn on the shoulder or crossbody. The strap is thick and strong. It goes through the fold-over flap and can be removed if you want to use the bag as a clutch (I haven't done this myself but it is possible). I can comfortably fit my iPhone 8, YSL card holder, keys, lipstick, and compact in the main compartment. There's room to spare. Since the flap is support all the weigh, be vigilant about not overfilling or putting very heavy items inside. The "Saint Laurent" tagged push-fastener clasp works seamlessly. To release, you squeeze the sides to release the lock. To secure, gently push the clasp into center of the lock. The bronze hardware on the clasp and strap is high-quality and durable. I'm 5'4 and adjusted the strap to the shortest length. At first, I was slightly worried that it would be too long. However, it ended up being perfect, hitting me at my hip. No worries if you're taller, there is plenty length to fit your fame.